Can Sabinas is a lovely property located on the south-west coast of Ibiza and within walking distance to the most stunning beach of the island - Cala Bassa. Other closely located beaches are Cala Conta (5 minutes drive), Cala Jondal (15 minutes drive) and Ibiza town is a 20-minute drive. 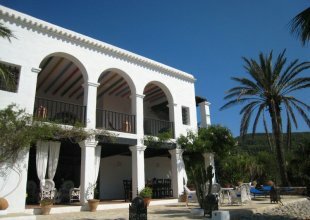 Can Sabinas is located in a very quiet and private neighbourhood with the occasional mountain bike group or couple on a quad bike passing by looking for a quiet cove to go for a swim. There are some fantastic walking paths around the headland which are good for morning or evening runs and take you along the coast the whole way round to Cala Conta and beyond if you feel up to it! The main house consists of a stylish open plan living area with kitchen and a small indoor dining area overlooking the back garden. This air conditioned room opens out to the pool area and also the back garden, letting in plenty of light and creating a lovely and social central part of the house. There is also a sofa area with flat screen TV with UK freeview channels and DVD player. There are 5 bedrooms and 5 bathrooms, which easily accommodate groups of up to 10 people. Three of the bedrooms have modulated double/twin beds and 2 of the bedrooms have fixed double beds. When walking into Can Sabinas you feel like you're in an oasis. The villa is surrounded by many different areas for relaxation and social times and the villa feels very private and welcoming. There is a large, cosy shaded chill-out area with sofas and cushions where most guests spend their time reading, having evening cocktails or an afternoon nap. There is also a roof terrace with sofas and cushions which is a perfect hideaway when you need a moment to yourself. There is a shaded out-door dining area with a large table that can sit up to 12-14 people. There is also a breakfast setup at the front of the villa with a small sofa group and table.